Alhamdulillah, I can’t even begin to explain how blessed I am. I am so happy in my life and I have been given so many amazing opportunities and I’ve lived so many amazing experiences. But I have to say, whenever I count my blessings, I really have to count my students twice. They really are the sweetest group of humans that I have ever had the pleasure of working with. Some students have even invited me to spend holidays with their families! I take up and return a lot of papers from my reading and writing students, however there are only speaking assignments for my listening and speaking students. 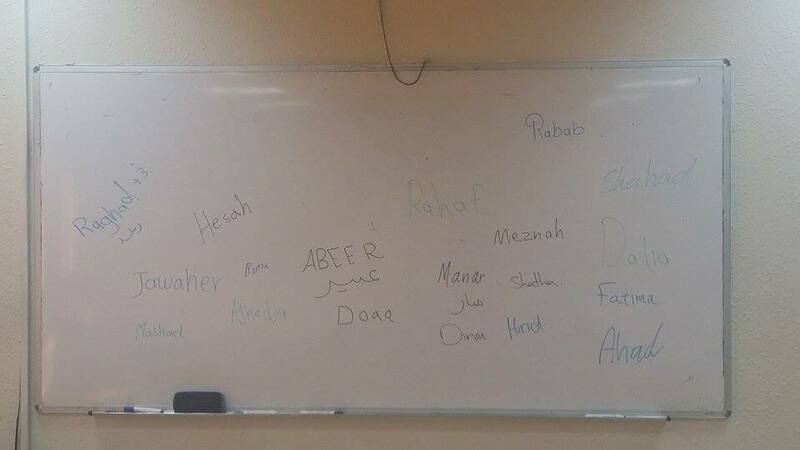 I am really having a hard time memorizing their names, so today I had everyone come write their names on the board. I tried to match the name with the student until I learned everyone’s name. When the class was almost over, I told the students they could leave, but I would dismiss them by name. If i didn’t know your name, you had to stay until I remembered it. I can’t even tell you how hard we laughed, and how badly I messed up. They also laughed when I refused to tell them my named with the logic of “you can’t complain that I don’t know your name if you don’t know mine.” But seriously, my job wouldn’t be half as amazing if I didn’t have such great students.